Not a class, not a conference, not a webinar! Get it the same day you order it! Just $97. And you get more than 400 strategies. Digital version - expect delivery via e-mail same day of ordering. We wanted the top pros to jot down on a piece of paper (or 10) their "insider secrets" for carpet cleaning success. And then hand them over to us. Well, they did it! We ended up with almost 350 PAGES of money-making techniques that work for beginners and seasoned pros alike - tried, tested and proven. From quick money making tips to complete strategies, there is no slow season when you dominate your territory! “Selling without selling” – upsells without resistance (3 different ways). $100,000 a year with only 20 customers (not big business or hotels). Joe Polish told how to beat the heck out of a sluggish economy and the "Slow Season." Internet maven Gary Arndts (Marketing Zoo) shows you that over 1 million customers a month are looking for carpet cleaning and what to do about it. Howard Partridge gives you 9 killer marketing ideas to get more business -- now. 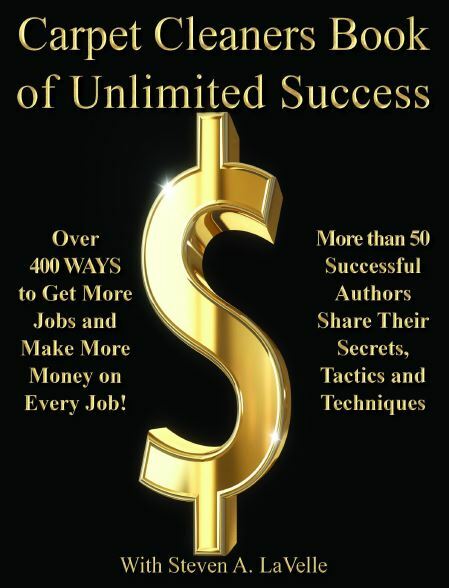 Jeff Cross (Totally Booked University) gives you a whole bunch of "quick tips" for no cost/low cost success. Mike West handed us a one page "promise" that can make you a fortune! Rob Hanks showed us how to get more customers every month! How to “milk” Craigslist like a money cow (double your responses)! "Fire your crummy customers and make a whole lot more money!" Amazing and true! One guy was devastated when his competitors convinced the local paper not to accept his ads -- then he came back at them like a juggernaut! He clobbered them with a 32:1 ROI! Now his secret is yours. And we gathered them all up so we could hand them over to you. Get the book the same day you order it. Learn your first technique in minutes! Put it to work the same day! !